E.A. Smithe is a reclone--a clone of, in his case, a dead mystery writer, with the writer's recorded personality and memories uploaded to him. He's not a legal person, but a piece of property, specifically the property of a local library. He lives on a "shelf"--a three-walled room--at the library, and patrons can consult or borrow him. Which is what Colette Coldbrook does. She's trying to find the secret she believes must be hidden in the book her brother found in their father's safe--Murder on Mars by (the original) E.A. Smithe. Her father had gone from midlevel executive to widely respected financial genius--but where his original capital came from remains mysterious. Now he's dead, and her brother was murdered, apparently for the book, and Colette wants to find answers. The story she tells is confusing, but she really is being pursued by quite dangerous people. The current E.A. Smithe has lived a very sheltered life, but he has his original's memories of writing--and researching murder mysteries, and despite a mild, professorial manner, he's not easily intimidated or confused. And he's very, very observant. He also has his own agenda--remaining valuable enough that he won't be deaccessioned and disposed of. 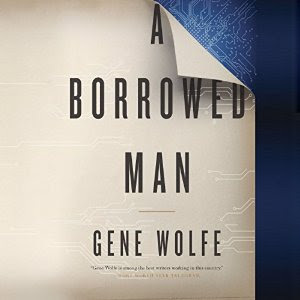 Calling this a nicely intricate tale will be recognized as an understatement by anyone familiar with Wolfe's work, and his use of the English language remains as beautiful as ever. The plot moves, and the characters, not just Smithe himself but Colette, the friends Smithe finds, and others along the way are developed and interesting. You'll be confused until the end, and you'll enjoy the ride. I received a free copy of the audiobook from Audible in exchange for an honest review.